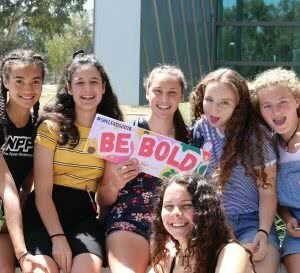 The annual She Leads High Conference is a one-day leadership event specifically targeted at young women, including female identifying and non-binary people, in years 9 and 10. This event aims to provide attendees with an understanding of the fundamentals of leadership, and explores topics such as social and emotional development, peer relationships and pressures, self-esteem, and body image. Upon completion, attendees are empowered to start defining and developing their leadership pathway. The event format includes interactive workshops, keynote speeches, and speed networking with young women who are leading in their communities. The annual She Leads High Conference was held on 1 November 2018, bringing together 118 young women from 11 ACT and Canberra-region schools. This year, the Conference was opened to surrounding rural schools and gained the participation of 2 rural NSW schools. The theme of the conference this year was Be Bold and encouraged students to identify the myriad of unique leadership types within the community, alongside working toward building their own leadership style and identity. Two workshops were run on the day, including Being Bold But Not Alone, facilitated by Defence Force Recruiting, and Positive Identities, hosted by YWCA Canberra’s Youth Engagement Team. Speakers included MC Laura Campbell, keynotes Dhani Gilbert and Taylor Perrin. Speed networkers included Kavinya Welikala, Shibanni Dave, Vivian Chan, Morgan Marshall, Tahlia-Rose Vanissum, Esther Suh, Julia Faragher, Annie-Lea Rowley and Jazmeen Payne . All speakers arranged their talking points around how to ‘Be Bold’, the Conference theme, and each attendee came away tips and tricks to build confidence, form a leadership identity and work together to empower one another. The inaugural She Leads High Conference was held on 28 November 2017 at the Ann Harding Conference Centre, thanks to our on-going partnership with the University Of Canberra. The event brought together more than 80 young women from 12 ACT and Canberra-region schools. The theme of the conference was Be Fearless and challenged the idea of what a leader may look like in order to assist students to build their own leadership identity to begin their unique leadership journey‘s. Students left the Conference with an understanding that they can be a leader in their homes, schools, workplaces and communities coupled with the skillset to identify potential issues, the confidence to address them directly and the tools needed to overcome these issues. Two workshops were run on the day, including Language for Empowerment, facilitated by Stella Schools, and Positive Identities, hosted by YWCA Canberra’s Youth Engagement Team. Speakers included MC Laura Campbell, keynotes Francesca Maclean, Nipuni Wijewickrema, and Izzy Mudford. Speed networkers included Julia Faragher, Moira Cully, Sam Launt, Holly Vanderpol, Sophie Hope, Esther Suh, and Ciara Duggan. All speakers arranged their talking points around how to ‘Be Fearless’ and each attendee came away with specific steps to take when they face failure and discovered new ways to succeed. She Leads High Conference will be returning in 2019, watch this space for more details.